Toronto, ON, CanadaAccepting Patients Soon. Phone # will be provided. 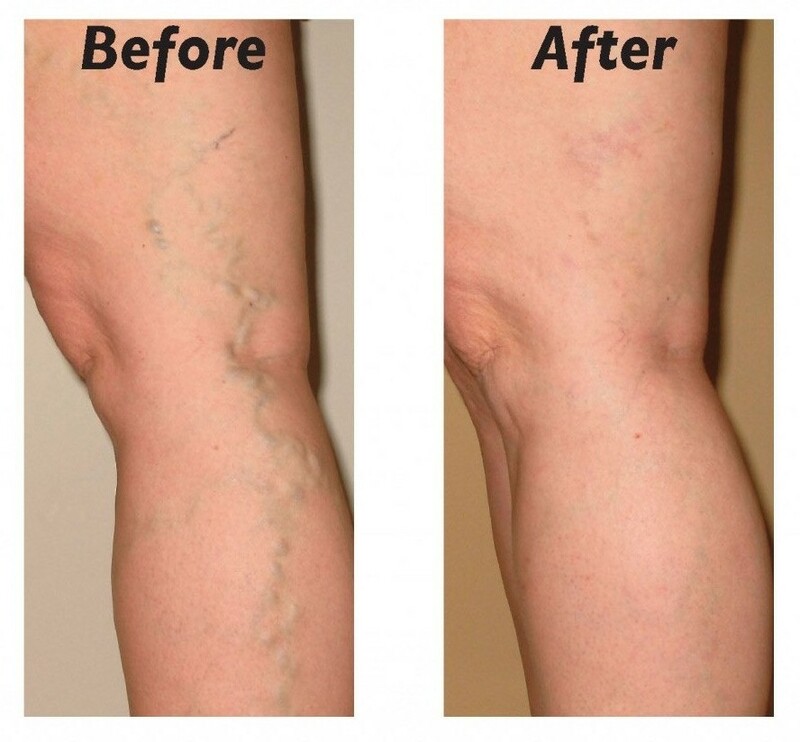 If you have varicose or spider veins you may want to consider Sclerotherapy. Sclerotherapy is accomplished by injecting a solution (usually a salt solution) directly into the vein. The solution causes the lining of the blood vessel to swell and stick together which causes the blood to clot. In time, the vessels turn into scar tissue that fades from sight. This therapy is proven since the 1930s. Varicose veins can be treated with the use of lasers. How does this work? Well, the heat from the laser causes damage to the vein; scar tissue forms; the vein closes and loses its source of blood and subsequently dies. Within two years the vein will most likely disappear. Simple laser treatments are used to treat small varicose veins that are located just under the skin’s surface and spider veins. Multiple treatments are usually needed six to 12 weeks apart; prescribed by your doctor of course. Poor blood circulation may require surgery, sclerotherapy, radiofrequency treatment or endovenous laser treatment. Simple laser treatments have been performed for over 20 years and are safe and effective. Recovery times are short and you’ll be back to your daily routine. Treatment of larger varicose veins in the leg can be done by Endovenous Laser Treatment. This treatment uses a laser fiber that is passed through a catheter into the vein. A local anesthetic or a light sedative are used for this treatment. Laser treatments are less painful that vein stripping or ligation, has a shorter recover time as well and does not require the use of a general anesthetic. Endovenous Laser treatment has a 94% success rate. Choose your surgeon wisely to ensure your success rate. After the treatment you will be looking at a recovery time of one week or more. Side effects are less likely if you use an experienced doctor. Speak with your doctor to learn more about the probabilities of side effects occurring. The side effects you could experience are: skin colour change; skin burns; blood clotting in the vein or a deep vein; and/or burning or painful feelings after recovery from nerve damage (less likely than after vein stripping). Not happy with waxing, shaving or tweezing to removed unwanted hair? Well then, Laser Hair Removal may be the answer for you! 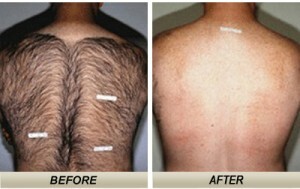 Laser hair removal is one of the most common cosmetic procedures performed. Concentrated beams of light is projected onto the hair follicles. Pigment in the follicles absorb the light and the hair is subsequently destroyed. Speed: Given that many hairs can be treated simultaneously – an area the size of a quarter approximately every second – you can see that it would not take much time to perform treatment. Less than a minute for an upper lip and up to an hour for a back as examples. Although common and viewed as a simple everyday procedure, laser treatment must be performed by a professional that has had the proper training. Consult with your cosmetic clinic to understand the credentials of the doctor or technician who will be performing the procedure. There are potential risks that you should have the doctor explain to you. Leading up to the procedure you should be asked to limit any plucking, waxing and electrolysis for approximately six weeks prior to treatment. The hairs roots need to be intact for the procedure. Also, any exposure to the sun should be avoided during this same timeframe. After the procedure, to ensure the effectiveness of the procedure, continue to avoid the sun for an additional six weeks. Depending on the laser light source used you and the doctor/technician may need to wear appropriate laser eye protection. In addition, to help the laser light penetrate the skin, you will need to protect the outer layers of your skin will a cold gel or cooling device. After your treatment, you may have some discomfort and may be given anti-inflammatory lotions, ice packs or cold water to provide relief. Your treatment will continue until the targeted hair stops growing. For a couple of days afterward your skin may look and feel like it is sunburned. Wear sunscreen for a month to prevent temporary changes to the colour of the treated skin. In some cases blisters (rare) may occur; usually seen in patients with dark complexions. Redness, swelling and scarring are potential sided effects of which you should be aware. Your doctor will brief you on all of this.